Making sure our senior loved ones are healthy and happy is always a concern, but it’s not always easy to do, especially if you live far away. A phone call can go a long way, but many people want to be more involved than that due to their loved one’s health conditions. For those with family members that have dementia, the stress is exacerbated. Did they remember to take their medication? Did they make it to the store okay? Are they getting enough to eat each day? It can turn into an endless stream of worries and concerns, leaving you feeling drained. Fortunately, the age of technology has made it easier than ever to stay in touch with the people we love and to help them make the most of their days. No matter how far away you are, there are several ways you can help the senior in your life with daily activities and keep them safe despite their changing cognitive function. The key is to do some research on the different apps and services available to find the ones that are best for you and your loved one. The elderly are, unfortunately, often targets for thieves and burglars. This is in part because they are the least likely demographic to fight back, but also because it’s believed that they will have valuables in their home. If your loved one lives alone or still lives at home, consider having a surveillance camera installed on the premises that sends a live feed directly to your smartphone or tablet. This way, not only can you keep an eye on things from far away, you can ensure you have the ability to play back any wrongdoing for police. Unfortunately, your loved one may be unknowingly decreasing their home security. As you know, dementia makes remembering difficult, and forgetting to lock the door could mean the difference between safety and a breakin. Consider installing smart locks on your loved one’s door. You can check that their door is locked each night, as well as when they are away, and quickly lock it with the push of a button if you find that they forgot. Just because you’re absent much of the time doesn’t mean you can’t be there in spirit. If you’ve enjoyed cooking for your loved one in the past, set up a cooking service so that fresh meals will be delivered to their home (or have someone come in and prepare the food there). Or, you might hire someone to come and walk your loved one’s dog every afternoon. This is an especially useful service if they have limited mobility or are struggling with dementia. Hiring help gives you the peace of mind that they are being taken care of, while also enabling them to maintain some of their independence. While some seniors aren’t comfortable with using too much technology, many are finding that services like Skype can help them stay in touch with the people they love the most. Help your loved one set up a video chat service so they can reach you anytime. This will be especially helpful around the holidays if you can’t get away to visit, as well as a way to check in daily. If you senior isn’t tech savvy, this doesn’t mean you can’t still use it to your advantage. There are several products, such as GPS-tracking sole inserts and watches, that enable you to keep track of your loved one and avoid wandering. Perhaps an automatic pill dispenser would be helpful in the early stages of dementia, rather than a phone call that your loved one might view as a nuisance rather than helpful. Medical alert alarms are a great way to ensure your loved one is safe and can get the help they need even if you can’t be there. Help them set up an alarm system such as this one, which can assist with everything from a medical emergency to a home intrusion to a fire. These alarms are made especially for seniors and people with disabilities, including Alzheimer’s and dementia, so they can be crucial tools to help someone with limited mobility get help in the event of a crisis. Help your loved one get connected to others in the senior community by finding online support groups and clubs. Staying social is crucial for elderly individuals and can help improve memory function, mood, and general wellbeing, especially those seniors showing early signs of dementia. You may feel guilt for not being able to be there for your loved one as much as you would like to be; keep in mind that showing your love and support by helping them stay healthy and happy is just as good as being there yourself. Evanston IL Among 2018 Gold Medal Award Finalists for National Gold Medal Award. Evanston is in Class 3. This is of population 75,000 to 150,000. There 5 public beaches including a dog beach and a boat launch. There are swimming beaches and sailboat rentals and classes available. The National Gold Medal Award honors communities throughout the United States. These cities demonstrate excellence in long-range planning, resource management and innovative approaches to delivering superb park and recreation services with fiscally sound business practices. The National Gold Medal Award Program includes seven classes. 5 classes based upon population. 1 class for armed forces recreation and one class for state park systems in odd numbered years. At the beginning of each calendar year, agencies are invited to submit applications for consideration, with a deadline of mid-March. Finalists are announced at the end of April. A panel of five park and recreation professionals reviews and judges all application materials. Importantly judges were chosen for their considerable experience and knowledge in parks and recreation on both local and national levels. The City of Evanston’s Parks, Recreation and Community Services Department joins three other finalists in the Class III category for cities with populations of 75,001 to 150,000 that will compete for grand honors this year. Other finalists include Bloomington Parks and Recreation Department (Bloomington, IN), Greeley Culture, Parks and Recreation (Greeley, CO), and Lawrence Parks and Recreation (Lawrence, KS). Highlighted in Evanston’s award application were the department’s efforts to positively impact all members of the community through services, events and programming, including Mayor Hagerty’s Summer Youth Employment Program (MSYEP), long-term care ombudsman services, summer camp reading program in collaboration with the Evanston Public Library, and others. Also included were new department initiatives, such as the “Let’s Play”. Also engagement trailer, which brings recreation opportunities to neighborhood events. Installation of the Ecology Center’s apiary and pollinator garden, which facilitates educational programming. The City also noted its wide variety of cultural events. 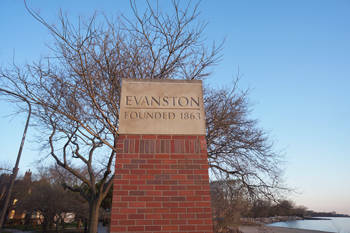 Evanston offers the World Arts & Music Festival, as well as its diverse, skilled staff, which includes Olympian figure skating coaches, a member of the Screen Actors Guild, certified Kingian non-violence trainers, and many others. Also check out Evanston IL Downtown Rated In Top Ten!